WHAT IS KLAMATH'S BEST BLUE GREEN ALGAE? Blue-green algae (Aphanizomenon Flos-Aquae or AFA), also known as Cyanobacteria, are primitive autotrophic prokaryotes. They are a source of food in some parts of the world and patients take the supplemental form to prevent and treat a variety of health disorders. Lake Klamath’s Blue Green Algae is one of the most nutrient-dense, balanced, whole foods on earth. It provides a full spectrum of vitamins and minerals, plus it contains protein, enzymes, chlorophyll, and essential fatty acids necessary for good health. The algae is 70% complete protein, containing all 10 essential amino acids, (a total of 20 in all,) which are in a profile very similar to that required by the human body. It contains low molecular weight amino acids, which may cross the blood brain barrier, hence its nickname, a "brain food”. It has one of the highest sources of chlorophyll and has been called an excellent blood purifier. It contains many of the vitamins and naturally chelated minerals and trace minerals needed for good health. Minerals are necessary co-factors needed to fully utilise vitamins, enzymes and proteins. It is high in Beta Carotene (Pro Vitamin A), a valuable antioxidant and also in Vitamin B-12, so it is an excellent food for vegetarians and non-vegetarians alike. It is an anabolic substance which means that it is fully digestible, highly assimilable, more readily metabolised and utilised by the human body. It is a completely natural substance. Klamath Blue Green Algae is one of the few edible micro algae, and differs from others as it grows wild in an optimal mineral-rich environment - mineral-rich Upper Klamath Lake, Oregon in North America which allows it to develop a unique nutritional profile. Upper Klamath Lake is of the few remaining alkaline lakes on the planet and has a very high mineral concentration due to volcanic ash deposited in the area 7000 years ago. The water contains 60 times the nutrients needed for the AFA to reach its full potential. If the lake were emptied of all of its algae, it would be able to regenerate itself within a few days; AFA is therefore environmentally sustainable. 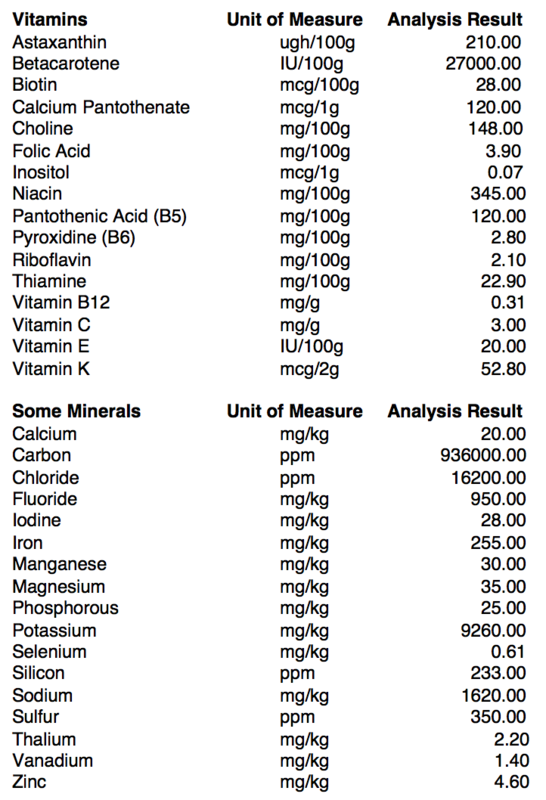 Historical Usage of Klamath Blue Green Algae As a single cell form, it is about 98% absorbable, comparing favourably to synthetic vitamin and mineral supplements. Klamath algae contains a full spectrum of natural antioxidants, organic minerals and trace elements, plus all vitamins, all amino acids (70% protein- higher levels than meat and containing all 8 essential amino acids), plus essential fats and enzymes. In particular, it contains a high content of pro-vitamin A as beta-carotene, a high content of B vitamins, 100% of RDA of vitamin K per gram, plus over 50 minerals and a complete spectrum of the rarer trace elements including organic fluorine and vanadium, which contributes to the normalisation of blood sugar control, whose imbalance can promote some forms of depression. Because the minerals are organic and naturally chelated, they are easily assimilable. Klamath blue green algae also contains all 15 carotenoids – the family of natural fat-soluble pigments which are powerful antioxidants. And unlike isolated betacarotene which can promote oxidation, this wider spectrum of carotenoids has a significant antioxidant capacity. It is also one of the original sources of Omega 3 with a balanced proportion with Omega 6 (3:1) and has been shown to decrease plasma levels of arachidonic acid and therefore has anti-inflammatory properties. All these nutrients explain in part its value to the nervous system – for example the B vitamins and magnesium are important for stress tolerance and for its proper functioning, the amino acids are building blocks for neurotransmitter production and antioxidants and Omega 3 are needed for healthy neurons. Chlorophyll and Detoxification Klamath blue green algae is not only supplemented for its nutritional content but is also used for detoxification. It contains a high quantity of chlorophyll and once ingested, chlorophyll has been shown to be a powerful antioxidant, a natural antiseptic, and pH balancer. It also possesses anti-tumour abilities and can bind to environmental chemicals, preventing them from attaching to DNA. Given that each year, tonnes of chemicals, heavy metals and carcinogens are released into the atmosphere and can accumulate in our tissues, including our nervous system, it may be prudent to ingest something that can harmlessly bind with them to promote excretion. Like chlorella, Klamath blue green algae can chelate toxins and is often used as part of a protocol for heavy metal detoxification. For example, it is routinely used on new patients at the Hippocrates Health Institute, USA for this very reason. Klamath Blue Green Algae's Affinity with the Brain and Nervous System There are two unique ingredients which explain Klamath blue green algae's particular value as a brain supporting supplement. As well as the broad range of nutrients mentioned, AFA is a valuable source of phenylethylamine (PEA) – a natural endogenous amphetamine which is able to modulate mood. PEA is known as the 'love molecule' because it increases the natural endorphins usually produced when we're in love or during exercise. PEA works by activating the neurotransmission of dopamine and other catecholamines in the brain. Unlike synthetic amphetamines, which are not easily metabolized and continue over-activating the nervous system to the point of damage, PEA is considered a natural neuro-modulator, which can be used according to our homeostatic needs and is quickly eliminated when it is no longer required. This is the reason that PEA can be safely taken indefinitely by Parkinson's or Alzheimer's patients, where it is not just a case of poor metabolism of neurotransmitters but also low production of neurotransmitters due to the degeneration of neurons. The role of dopamine has been implicated in Parkinson's and Alzheimer's disease; Parkinson's patients have in fact found to be PEA deficient. Antioxidant and Anti-inflammatory Properties of Klamath Blue Green Algae As well as providing a rich natural source of PEA, Klamath blue green algae contains the aforementioned AFA phycocyanins which gives the algae its blue pigmentation. Phycocyanins from Spirulina, have been shown, in many animal models, to have strong antioxidant action. In vitro studies on lipoperoxidation which have compared Spirulina's phycocyanins with AFA –phycocyanins have shown that the latter can inhibit lipoperoxidation more effectively – typically by 50% at very low doses. In vivo studies in humans have showed that the level of MDA (Malonyldialdehyde), a byproduct of lipoperoxidation (LPO), has a direct link to the health of the cardiovascular system, the bones, joints, eye and the nervous system. Moreover, AFA phycocyanins also function as COX-2 inhibitors, similar to non steroidal anti-inflammatories, but without the side-effects. Since low grade inflammation is now associated with most health conditions, especially to those of the nervous system, this may be another reason for its benefits. For instance, AFA has been shown to block the production of the inflammatory agent leukotriene B4, linked to migraines and headaches. A recent study has also shown that Klamath increases the levels of the body's own endogenous antioxidants (vitamin A, vitamin E, and carotenes) by reducing the oxidative stress which contributes to health problems. As well as AFA phycocyanins, it also contains all carotenoids, including alpha and beta-carotene, xanthophylls such as lutein and lycopene and canthaxanthin which have been shown to have powerful protection against neurodegenerative diseases such as Alzheimer's, Parkinson's and multiple sclerosis. Klamath Blue Green Algae Potential Benefits to ADHD and Autism Another area where Klamath Blue Green Algae may prove beneficial is to children with ADHD – Attention Deficit Hyperactivity Disorder, as it has been found that children diagnosed with this condition are significantly deficient in PEA. In fact, Ritalin increases production of endogenous PEA, but with side effects which may include neuronal damage. Although many children with both ADHD have appeared to considerably benefit from AFA, clinical studies are warranted to verify this. In conclusion, Klamath Blue Green Algae provides a broad range of bioavailable nutrients including chlorophyll to chelate heavy metals and other toxins, as well as key molecules such as PEA and AFA phycocyanins which have been shown to provide particular support to the nervous system. AFA also provides significant antioxidant protection and has a balancing effect on neurotransmitters especially dopamine, helping to relieve stress by its action on the HPA axis and is associated with improved mood and concentration as shown in clinical studies. An extensive research project led by Dr. Gitte S. Jensen at the Royal Victoria Hospital in Montreal, Canada studied the effect of Aphanizomenon flos-aquae (AFA) on the immune and endocrine systems, as well as on general blood physiology.“Effects of the Blue Green Algae Aphanizomenon flos-aquae on Human Natural Killer Cells.” Chapter 3.1 of the IBC Library Series, Volume 1911, "Phytoceuticals: Examining the health benefit and pharmaceutical properties of natural antioxidants and phytochemicals." To order Klamath or for more information about this amazing supplement email Professor Celene Bernstein on celenebernstein@zest4life.com or telephone on 082 3388 185. Alternatively, you can also fill in our contact form.